To get us started doing something useful with Qt Designer, we are going to build a simple program that will show you the power of Qt Designer and KDevelop. I hope that this will help you to create your first "real" KDE application. 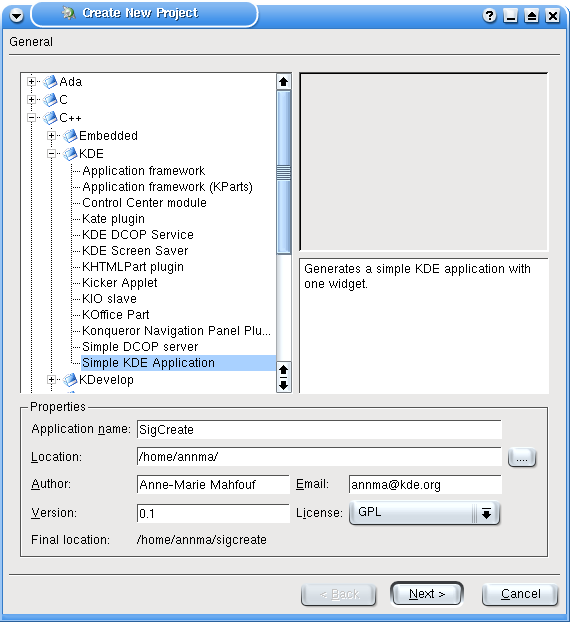 KDevelop will help you to build a complete KDE application. The KDE project uses the autoconf and automake tools for KDE 3.x, and KDevelop will provide you with all the necessary files (admin directory, Makefile.cvs, Makefile.am,...). 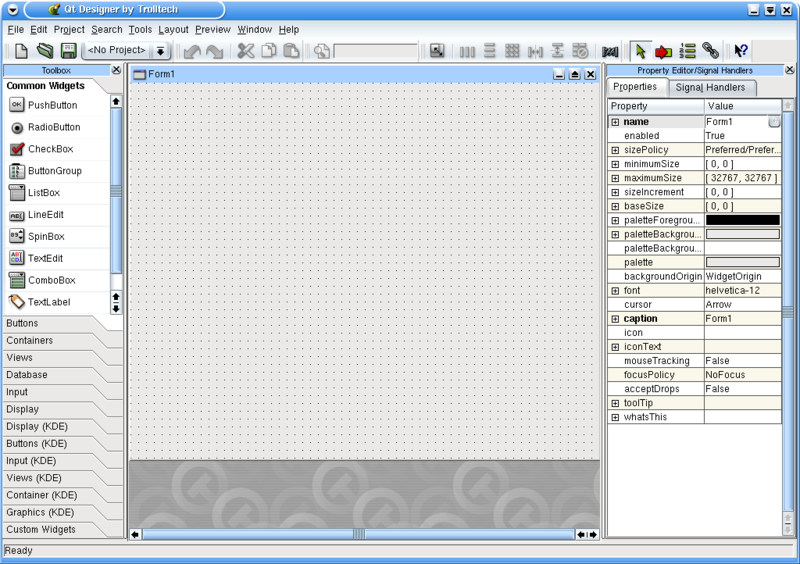 Qt Designer is a tool for designing and implementing user interfaces. It helps you arranging your widgets on a form and adding a proper layout so your interface can be resized properly. I recommend that you read the Qt Designer manual to know everything about Qt Designer. Qt Designer includes a code editor but we'll use KDevelop to edit and modify all code. We will now create the interface of our application using Qt Designer. A form from Qt Designer is saved with a .ui extension because it is then processed by the uic program to generate a .h and .cpp files. KDevelop takes care of that, the only thing we need to do is to create the form. Note: Each time you add or remove a file (now we will add a .ui file) in your KDevelop project, the Makefile.am will be changed. KDevelop does that itself but you will need to Run automake & friends after such changes. Click the OK button. The Automake manager dialog then pops up. Click the OK button for this dialog as well. If the new file sigcreatedlg.ui is not open in Qt Designer, open the Automake Manager, right-click on the file and select Open With -> Qt Designer. Qt Designer will open. Tip: About the names: it is a good idea to finish a dialog name or a form name by dlg to ensure a nice visibility for people who want to have a look at the code. 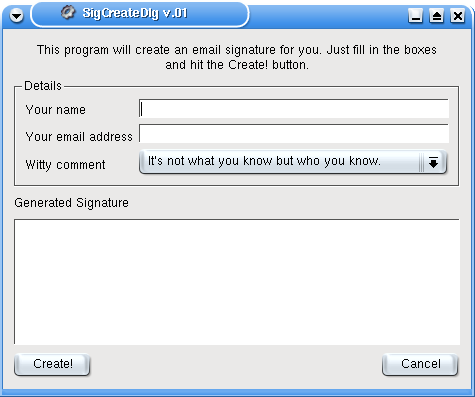 sigcreatedlg says that it is a dialog, i.e an interface class, only. The Qt Designer interface is essentially split into three areas. On the left is the toolbox, where you can select your widgets. On the right, several dialogs can be selected. I'll keep only the Property Editor dialog (I close the 2 others). Your widgets can be fine tuned to behave how you want them to. You can choose the size of the widget, its background color (palette), and so on. Between those 2 windows is the Form, your program window, within which you will design your user interface. Note: After adding the sigcreatedlg.ui file, you will have to run Automake & friends and Run configure before building the program. This ensures that the updated Makefile.am is now read. Each time you want to use Qt Designer, you should have a precise visual idea of the design of your interface. You can see in the following picture what the program will be like. This application creates an email signature, which is then displayed on the screen. The user should enter her/his name, email address, and then select one of three comments. When you click the Create! 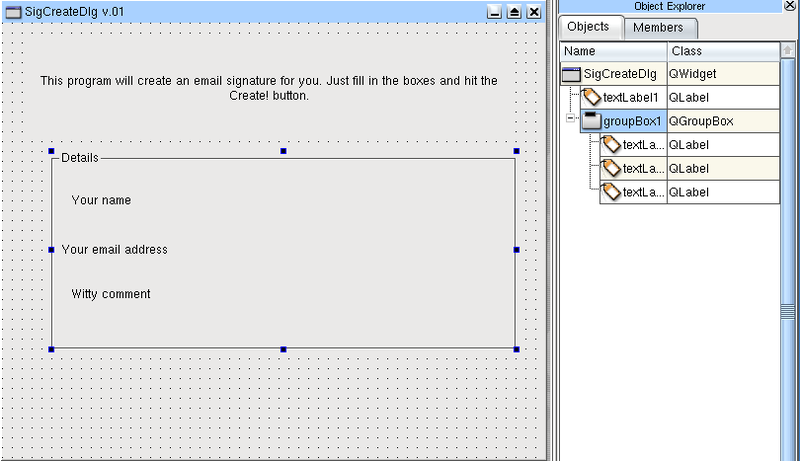 button, the generated signature is shown in a MultiLineEdit. When you click Cancel, the program quits. Note: Note that this project is meant as a tutorial, so this is somewhat far away from practical use. Go back to the Qt Designer window with the new dialog open. You will see that the property editor has been filled with details about the form you have created. The first line in the Property Editor shows the name of the form which is Form1. Click on the field with this name to change it and type SigCreateDlg. This will form the class name of the dialog so you should name it something useful. To change properties, select the property you wish to change, then alter its setting on the right. Change the Caption property to "SigCreateDlg v.01". We will now begin to add widgets on our dialog. The cursor will become a crosshair over the form. Draw a box for the label, just as you would in a paint program, and you will see that the label is created with some dummy text in it. You follow pretty much the same procedure for embedding any type of widget that is supported by Qt Designer; select it, drag it, and finally, change its properties and size. An interesting concept in Qt Designer is that widgets can act as containers for other widgets. This will be demonstrated in our next task, which is to create the input fields inside the frame. You can see that in Picture 8 we have a bunch of labels and text boxes inside a frame. This frame is called a Group Box and acts as a container for the labels and text boxes inside it. Let's first create the frame by selecting the GroupBox in the Toolbox dialog -> Containers or Tools -> Containers -> GroupBox from the menubar. You can drag the mouse to create the box just below the Label you created before. In the Property Editor you can change the title property to alter the text in the frame. Put Details in the title text field. You may notice a + symbol in this entry in the Property Editor. This indicates that the property has subproperties that can also be changed. Change the text of labels by double-clicking on it. Once you have done this you can then create the text boxes. They will allow the user to type in text like his(her) name and email address. 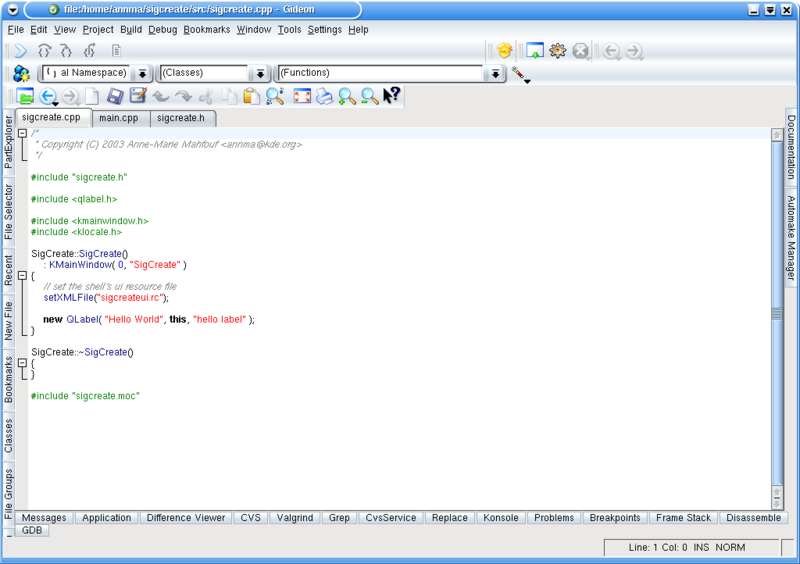 We use the simplest type of text boxes: a widget called QLineEdit which allows the user to enter one line of text only. 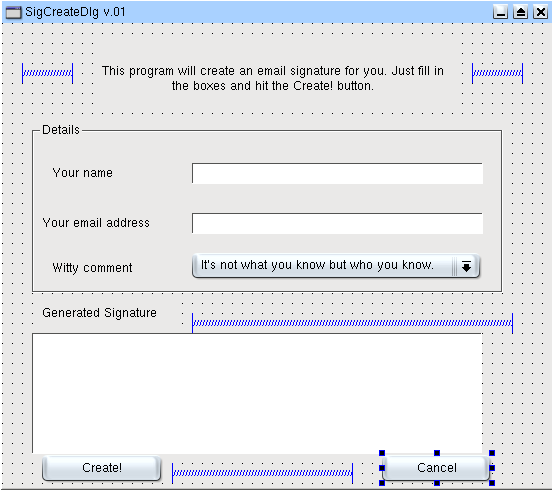 You have to create two QLineEdit widgets for the name and the email address. You choose the menu Tools -> Input -> LineEdit and you draw it beside the 'Your Name' Label. Do the same below for the address. The witty comment will be selected by the user. We use a ComboBox which will present the user with three comments. Click on the ComboBox icon or select it via the Tools -> Input-> ComboBox menu. Draw it beside the Witty Comment label. Then double-click on it. You will be presented with a box into which you can add the contents of the combo box. Click on the New Item button and type in your comment in the text box at the right. Then click again on New Item for the second and third comments. Click on OK when you have finished. Adjust the size of the different widgets so they are nicely placed. Up to now, we have not named any of the widgets that are being placed in our program. It is useful to set an internal name for widgets so we can call them after in the program. Labels don't perform any action so they don't need to be named but other widgets do. It is the case now for our text boxes. We'll need to manipulate the data from the three input widgets (i.e. read the text) so we should give them a name. Names should be easily recognized later and they should make sense. The names are assigned via the name property on the top of the Property Editor. We name the top LineEdit nameBox and the second one mailBox. We name the ComboBox commBox. This will allow us to access the comments. So click on each LineEdit and then besides Name in the Property Editor write nameBox and mailBox. Then click on the ComboBox and name it commBox. We finish the graphical design by adding a label with Generated Signature as text. Below it, we put a TextEdit (Tools -> Input -> TextEdit) where the generated signature will be displayed. We name it sigBox. And then we add two PushButtons at the bottom ('Create!' and 'Cancel'). They don't need names but you can give them some if you want. Save your form. You can now have a quick preview by selecting the menu Preview -> Preview Form. This is the form before layout management. This section describes the layout management. If you resize the preview window you will then notice that the widgets do not adjust appropriately. They are not resized. To improve things, we need to use a feature in Qt called spacers. Spacers are like virtual springs that push the widgets on each side apart. Note: Having a good layout is essential for your application, as when the strings are translated, they might be longer than the English ones and they need to fit on your widgets. The geometry of the widgets has to be nice if the user can resize your window application. Layouts are done by trial and error so use Preview -> Preview Form to see the result of your layout management and to achieve the best layout. The use of spacers and layout management is a skill that is developed through trial and error. The main thing to remember when dealing with spacers is that you work horizontally first and then vertically. We will first use spacers to center the text in the top box. Resize your label so that it is only the size of the text. Then we add two spacers, one at each side. Choose the spring icon or menu Layout -> Add Spacer. You adjust each of the spacers horizontally. Click the space to the left of the text and the blue spacer will appear . Repeat the same procedure for the right. Then add a spacer on the right of the "Generated Signature" label, and a last one on the left of the the "Create!" pushbutton. Please use this image as a reference. Now that we have spacers to fill blank space, we need a proper layout management. This will allow the widgets to be nicely resized whenever the main window is resized. It is really compulsory to have good layout management. Again, try to resize several times to see if everything is in place. We can use Vertical or horizontal layout or grid management. The top row of widget is horizontal (spacer + label + spacer) so we need Horizontal management. We need to select the three widgets alltogether: click on the first spring, then click on the label while holding down <keycap>Shift</keycap>, then on the second spring while holding down Shift. Then click on the Horizontal Layout icon or menu Layout -> Lay Out Horizontally. You will then see a resizable red line around the three objects to indicate that their layout is being managed. Resize the red box if it needs it. We can now repeat this procedure for the three labels inside the GroupBox, this time using vertical layout management. The same vertical management is used for the two LineEdit and the ComboBox. It is better to use vertical management to keep the objects aligned. If we use horizontal management for each label + text box then they will not stay aligned and equally sized. Horizontal management is needed for the label with the spacer and another one for the two pushbuttons and the spacer. Signals and Slots are used for communication between Qt objects. The signal/slot mechanism is a central feature of Qt and probably the part that differs most from other toolkits which often use callbacks. In Qt, a signal is emitted by a widget when a particular event occurs, very often triggered by the user like for example pressing a button or writing something in a LineEdit. A slot is simply a function that is called in reponse to a particular signal. Now the widgets are implemented and the layout is arranged the final thing we need to do in the design stage of the form is to create the signal/slot connections. To do this manually requires a connect() function but Qt Designer provides a simple yet effective solution. To create the signal/slot connections we need to use the connecting tool. To do this either select the icon (it looks like a red arrow going into a green square) or select Tools -> Connect Signals/Slots from the menu (or use the <keycap>F3</keycap> shortcut key). To create a connection, click on the form on the widget that is going to be dealing with the slot, drag the line off the form and release the mouse button. Let's deal first with the Create! button. Click first on the Connect Signal/Slot icon or select it from the Tools menu or use the <keycap>F3</keycap> key. Then click on the Create! button with the crosshair and drag the line off the form completely. When you have released the mouse button you will see the connections tool shown in the image. 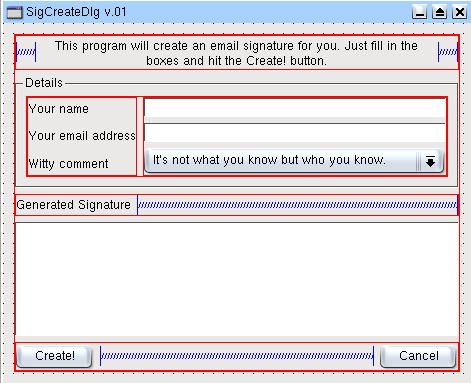 What we want to do is to create a slot that will create our signature when the user clicks on the Create! button. The signal will be clicked() (you may choose among five signals for a QPushButton) and we need to create the slot then make the connection. To create the slot we need to click on the Edit Slots button. The slot creation box then appears. Now click on the New Function button and a slot will appear in the box. 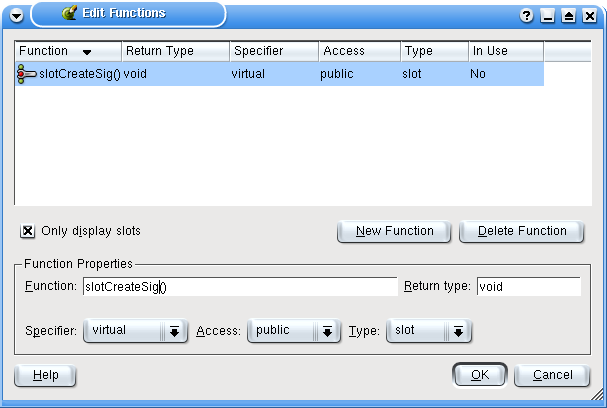 Instead of new_slot() rename it to slotCreateSig() and leave the access specifier as public. When you click on OK you will be returned to the connections box and you will see your new slot in the Slots section of the box. 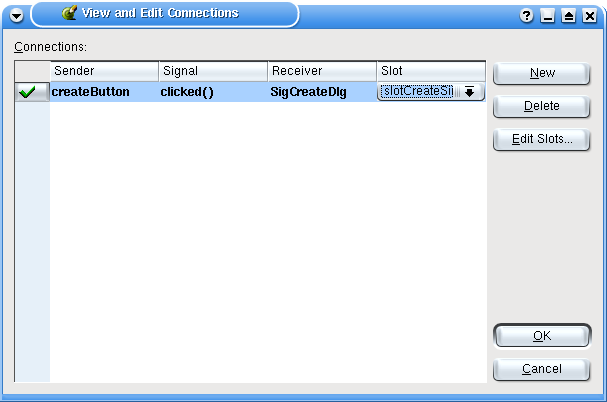 To make a connection you simply select the appropriate signal (which is clicked() in our case) and then select the slot (which is our new slot slotCreateSig()). When you have selected both signal and slot you will see the connection made at the bottom of the screen. After you are finished click OK.
Repeat the procedure for the Cancel button by using the clicked() signal and the close() slot. You are now done with the signals and slots. Warning: Don't forget to save your form! In this tutorial, we use KDevelop subclassing tool in Automake Manager. If you have KDevelop version which has not that capability, then please go to Chapter 7 where I explain this step without the subclass tool. 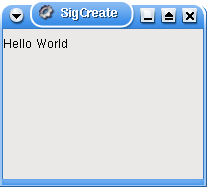 Here we start with the KDE simple project named SigCreate and the sigcreatedlg.ui that we have added in our project. In the Automake Manager, in the section sigcreate (Program in bin) you must have three files: sigcreatedlg.ui, sigcreate.cpp and main.cpp. The project must compile and give the main window as in picture 3 (creating.html). As the sigcreate class is no use for us, we will remove it and use it for subclassing the sigcreatedlg.ui file. 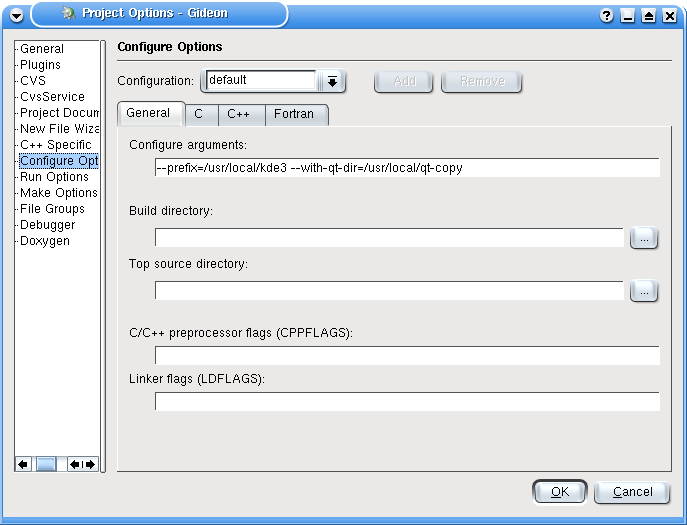 In the Automake Manager, right click on sigcreate.cpp and select Remove and a dialog pops up. Please check Also Remove it from disk. Then do the same with sigcreate.h. This is the way to remove obsolete files from your project and the Makefile.am will be updated. Remember to run Automake & friends and configure before compiling your project again. We will not do it right now because we will make other changes. We will now use the class name SigCreate for the subclass. In the Automake Manager -> sigcreate (program in bin), right click on sigcreatedlg.ui and choose Subclass Widget... from the context menu that appears. 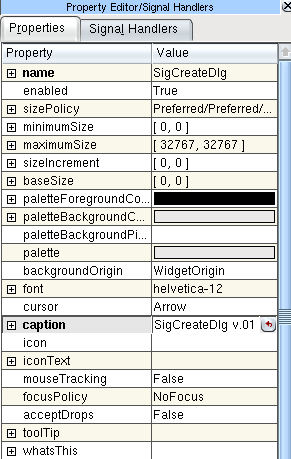 Then fill in the subclass name which is SigCreate. Check the box: Reformat source and click on OK. Say No then about adding these files in cvs as we did not enable this in our project. Note: You can see that the slot we created in designer is listed here and checked, the method will be implemented in the generated files. If you uncheck it, the code will not be generated in your class. Run Build -> Run automake & friends, Build-> Run Configure, Build -> Build Project, Build -> Install (or Build->Install as root user), Build -> Execute Program. That's it! The program is working! A few more words about signals and slots. The signals and slots mechanism is type safe: the signature of a signal must match the signature of the receiving slot (for example, you will connect valueChanged(int) with a slot having an int as argument). And another thing to keep in mind is that all classes that inherit from QObject or one of its subclasses (e.g. QWidget) can contain signals and slots. All the strings used in KDE program must be wrapped in the i18n() function (klocale.h as header) because all KDE projects are translated. Please see the KDE Translation HowTo to learn more about i18n to make translations for an application. Warning: Do not touch the .pot file! Note: Run a search in Google (in Konqueror, write gg:your_app_name) to see if the name you want to use is not the name of a copyrighted program. If this is the case or if in doubt, change it. Note: When your application has the most important features, when it's totally KDE compatible (i18n, xml GUI, ect. ), you will be able to ask for moving it in a KDE official package. This page was last modified on 25 May 2014, at 16:21.